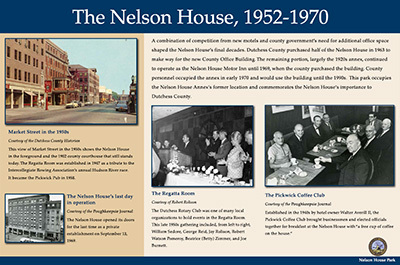 A permanent three panel outdoor exhibit depicting the evolution of the Nelson House Hotel and Annex is on display on the site where the Annex once stood at 28 Market Street in the City of Poughkeepsie. 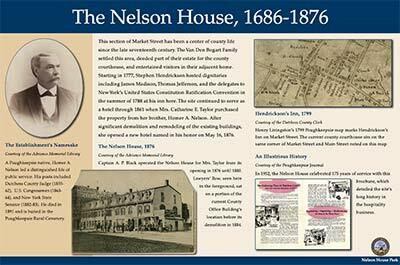 The exhibit also includes the original historical marker produced by the New York State Department of Education to commemorate the Nelson House in 1935 and an original hotel hitching post to which horses would be tied. 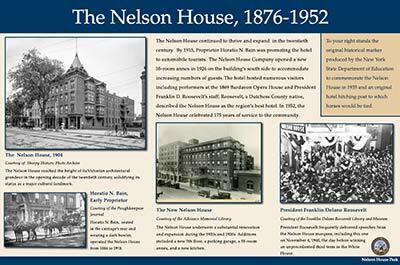 The Nelson House Park is open to the public all year round. Special thanks to the Poughkeepsie Journal and the Adriance Memorial Library for their assistance with various photos. High quality pdfs of each individual slide are available below - or you can download the full Nelson House Park presentation (.pdf).